Ryan McNutt (@ryanmcnutt) has written for The Coast and Maisonneuve. “Five Years” didn’t make the broadcast, though, which meant Bowie’s final televised performance wasn’t even of one of his own songs—though it sure sounded like it could have been. When Bowie invited Arcade Fire to perform “Wake Up” with him at Fashion Rocks, the Montreal band’s debut album Funeral was less than a year old and a sensation only in indie rock terms. Odds are the vast majority of those tuning into CBS on a Friday night to see the likes of Destiny’s Child, Duran Duran, and Alica Keys had no idea who the band was. Years later, in 2013, Bowie wound up providing vocals to Arcade Fire’s “Reflektor,” a song about image and reflection. That he seemed so perfectly at home in the song exemplifies how Bowie didn’t simply influence music from a passive distance, or only through his body of work. He influenced artists by engaging as a peer, right until the very end. Bowie’s Canadian connections don’t stop with Arcade Fire—and yes, they go far beyond astronaut Chris Hadfield’s “Space Oddity” video, too. There’s Canadian–Italian director Floria Sigismondi, for example, whose staggering music video resumé includes four Bowie videos for songs from 1997’s Earthling and 2013’s The Next Day. In 1990, Bowie collaborated with Montreal dance troupe La La Human Steps for his Sound and Vision tour. And around the time of his 2003 album Reality, it was reported he considered Montreal’s Godspeed You! Black Emperor and Sarnia’s Emm Gryner to be his favourite Canadian artists. If there’s a current Canadian artist who wears Bowie’s influence more explicitly than Arcade Fire, it’s Bejar, whose band Destroyer has attracted Bowie comparisons since its inception. Reviews of early albums such as 2000’s Thief and 2001’s Streethawk: A Seduction regularly mentioned Bowie, an obvious critical touchpoint for records featuring glam-rock sensibilities and fey, playful vocals. Of course, finding artists that Bowie hasn’t inspired would be a bigger challenge. But if there’s an era of Canadian music that was “peak Bowie,” it may have been the early 1980s, when Canadian new wave bands unmistakably wore his influence. At a time when Bowie was collaborating with Chic’s Nile Rodgers Let’s Dance, Canadian bands like Blue Peter and Chalk Circle brought some serious Thin White Duke moves to their European-aping sounds in their quest to find radio and MuchMusic video play. It was also a time at which some of Bowie’s most famous collaborators made their mark on Canadian music. There was Spiders from Mars guitarist Mick Ronson, who produced and performed on “Eyes of a Stranger,” the Juno-winning breakthrough hit single from Vancouver’s Payola$. And then there was Brian Eno, Bowie’s collaborator on his beloved “Berlin” trilogy of 1970s albums. He found his way to southern Ontario in the early eighties to collaborate on a number of prominent projects (including an ambient piece at an Ontario College of Art and Design exhibition in 1981) and started his ongoing partnership with Hamilton’s Daniel Lanois, leading to album credits with the likes of U2. Still, despite these examples, Bowie’s influence in Canadian music is opaque enough that explicit references to his work are few and far between in texts such as the iconic Have Not Been the Same and Bob Mersereau’s new History of Canadian Rock ’n’ Roll. 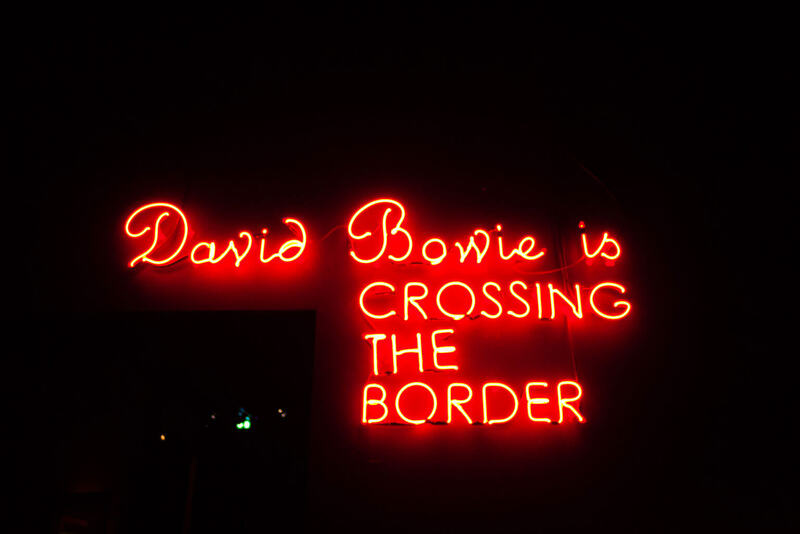 Part of this has to do with questions of identity: so much of our country’s engagement with music (from consumption to conversation) rests on definitions of Canadian-ness and authenticity, in stark contrast to the shape-shifting nature and alien-like orbit of Bowie’s evolving personae. Compare Bowie to Neil Young, his closest Canadian peer (though, yes, American-based). Like Bowie, Young released a series of uncompromisingly great albums in the 1970s, ones that frequently took radical turns from one another. But those twists in his career seemed to be conscious reactions against his work and perceptions thereof, whereas Bowie’s felt driven by his curiosity in the musical cultures around him: the early glam rock of Ziggy Stardust, the soul of Young Americans, the electronic sounds of Low, the MTV-era pop of Let’s Dance. His music was restless and placeless, more focused on discovering and learning from new worlds than sticking a flag in the ground. One of those worlds, appropriately, was Young’s. Accounts suggest Bowie listened to Young’s music frequently while writing 1971’s Hunky Dory, and during the Tin Machine era in the late ’80s and early ’90s he began performing “I’ve Been Waiting for You,” a song from Young’s 1968 self-titled debut. Bowie recorded his cover of the song for 2002’s Heathen (with Dave Grohl on guitar, no less), demonstrating how Young’s work could fit as well in his discography as everything else he tried his hand at. From beginning to end, Bowie took his musical curiosities and interests, made them his own, and through those engagements left a legacy of influence that few pop musicians will ever match.